Well, you may not be Captain Jack or sailing in a ship crewed by the undead, but you certainly will be sailing around the Caribbean, from Tortuga to St. John. The world of a ship captain, if Mr. Sparrow’s words are to be believed, is freedom; and that’s the world Merchants & Marauders brings to you. The goal of Merchants & Marauders is to earn 10 Glory points to show that you are the most renowned ship captain of the sea, but there are many ways to achieve those points. 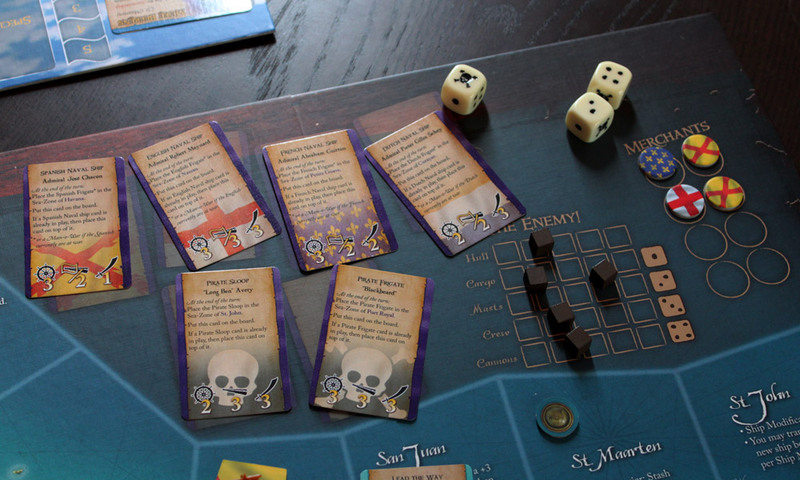 Each player takes control of a Captain, randomly dealt out at the start of the game, which features stats like Leadership, Seamanship, and Influence, and a ship which has stats such as toughness, cannons, and crew. During a players turn, they get 3 actions, and can spend those actions doing any combination of the following 3 things: Port, Move, and Scout. Each type of action can be performed multiple times per turn, as long as the 3 action limit is not exceeded. Move is the simplest, and involves moving between sea zones, or moving between a port and a sea zone. Scouting is what you do at sea in order to find other ships. You can scout for other players or NPC ships to attack them (and hopefully steal some gold or valuable cargo), or you can scout for Merchant ships in order to raid them. Certain “missions” and “rumors” can also be completed by scouting. A “Port” action must be taken at port, and allows a number of activities; from recruiting Crew, to selling and buying goods, to repairing or upgrading your ship, to buying an entirely new ship altogether. While I won’t go into to much detail regarding mechanisms, allow me to detail buying and selling of goods. To sell, you simply offload any goods from your cargo that you wish to sell. Goods sell for 3 gold each, unless they happen to be in Demand, in which case they earn 6 gold each. 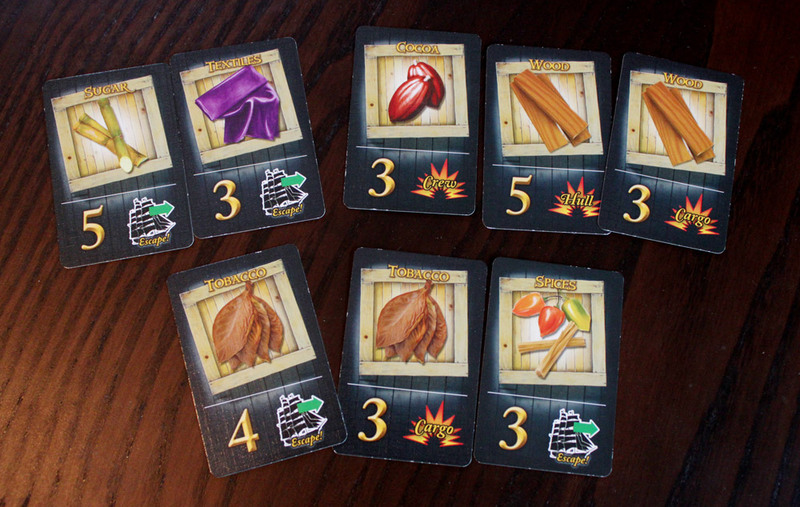 When you buy goods, you draw 6 cards from the “cargo” deck, discarding any that are in Demand and replacing them. Then, you can buy any for 3 gold each. If this sounds like a low profit margin to you, it is, but fortunately there’s a ‘hook’ (pun intended). If you draw multiple cards of a single good type, each additional card decreases the cost of that good to you by 1, down to a minimum of 1 gold. That means if you draw 2 “cocoa beans” cards, you can buy each for 2 instead of 3, and if you draw 3 “Wood” cards you can buy them for 1 gold each. Top half of the cards are the goods, bottom half is both the Gold you receive in a merchant raid and the damage you will take in that raid. There are two types of combat. Merchant raids are simple and quick – you draw Cargo cards, which have icons on the lower half to indicate merchant ship responses. Each icon indicates damage to a certain part of your ship or an attempt to flee. As long as no single element of your ship gets completely destroyed, and the number of “escape” cards does not match your maneuverability, you raid the ship, are awarded gold based on the cards you drew, and may keep any of the Cargo cards you can fit in your cargo hold. Your captain’s seamanship skill and a roll of dice allow you to modify the selection of cards you originally drew in order to protect your ship or make the encounter more lucrative. Of course, when you raid Merchant ships, you gain bounties from their respective nations, and soon you’ll have NPC ships coming after you. You may also have other players trying to collect on those bounties, or you may attack another player to steal their legitimate earnings. In any of these cases, you will have full-on ship to ship combat, which pits captain’s skill against captain’s skill and usually results in quite heavy destruction on both sides. 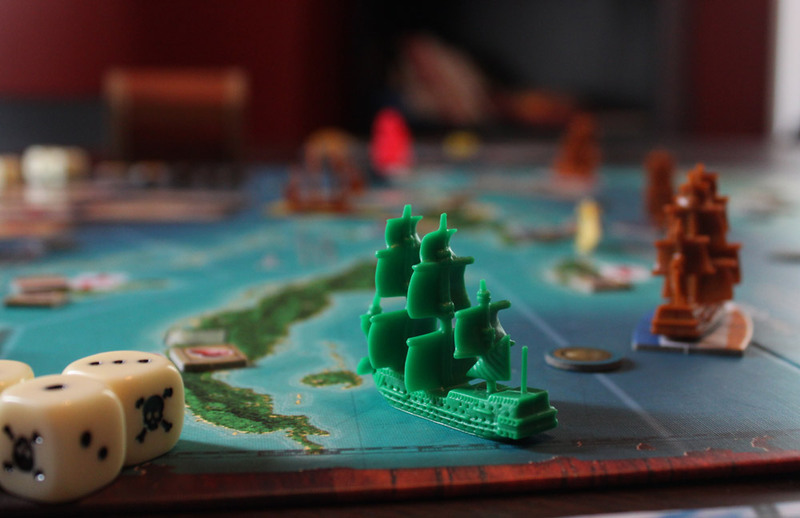 You can attempt to simply sink the opposing player’s ship, or you can attempt to board; a successful boarding leads to crew combat, with the final victor capturing the other player’s ship and all the gold, cargo, and miscellaneous bonuses that come with that. Tying all these actives together are the many ways you have to score Glory points. Buying a Galleon or Frigate is probably the easiest way to score a point. Raiding a Merchant and gaining 12 or more gold (no small task) will get you a glory point. Selling 3 In Demand goods gets you a glory point. Stashing 10 gold in your personal hideout is worth a hidden point, of which you can score up to 5 to be revealed at the opportune moment (that is, when you will win). You may also complete Mission cards (scattered about the board), discover Rumors, and attack and destroy other player’s ships. Along the way you’ll be able to purchase ship upgrades, buy special weapons, and earn Glory cards to try and get every advantage possible. And first to 10 points is the winner. Like Jack Sparrow’s Black Pearl, what Merchants & Marauders really is, is freedom. The freedom to sail across the sea, doing as you please, playing how you want to play. Whether you want to play the honest merchant, sailing from port to port to buy the cheapest goods and sell the most expensive ones, OR play the daring pirate who steals from the rich and gives to himself, you will find eddies and currents flowing in your favor. You won’t be precisely calculating market values and goods-to-points ratios in a tightly wound european gaming system here. Despite the presence of wooden cubes and goods to buy and sell, this is thematic gaming at some of its finest (some would call it “Ameritrash”). You’ll sail across the sea, undertake dangerous missions, and attack enemy ships, and you’ll have a blast the whole time you’re doing it. What a Blast! Get it? Like explosions and cannon fire! Will you be the savvy merchant, loading your cargo with valuable goods and selling them off just where they’re needed the most, or will you be the daring pirate, attacking merchants for an easy score (but making yourself a target for law-abiding captains and NPC ships alike). The two sides are pretty equally balanced – the “legal” side is slow and steady, but allows for more opportunities to take on missions and rumors, all the while not needed to worry about being harassed by the world’s finest in sea justice (although Pirate NPCs and other piratey players could get in your way.) Marauders, on the other hand, have the quick path to riches, scoring both gold and cargo with little effort, but they’ll have to sail twice as quick to stay ahead of the law, and quickly escalating bounties will keep them from many a legitimate port, cutting off access to valuable ship upgrades, certain missions, and even rumors. Either way you can have loads of fun. The game clips along at a decent pace, for such an involved game. While it’s certainly not as complicated as it looks, there is plenty to do, and a 3-hour playtime (the rulebook estimates 45 minutes per player) is not unusual. Although in my experience, the game tends to run more quickly than this, not more longer as many games tend to do). Turns can be a few minutes long or very very quick, depending on how far you need to move, but overall the length of a turn balances out and you can stay interested while waiting for your next go. Combat, the true game-slower, is fairly infrequent and is entertaining enough to watch to keep the players not directly involved as spectators. The freedom here is all about sailing where you want to go and doing what you want to do. As I said this is not an efficient-system-euro, and thus despite the many choices you will likely not see much Analysis Paralysis. If you’re unaware of the term, this refers to a player spending so much time analyzing their possible actions that it slows the game down. There is rarely a “most efficient” move, there are simply risks and rewards and you can take the one that feels most right. And while luck may be against you, and you may lose, you will still have played a game of freedom. You will have done plenty by the end to have earned at least a small amount of glory, whether you went down with your ship or scored boatloads of treasure. There is plenty of luck involved, with most missions and other tasks being based on dice rolls; dice rolls based on skill values and rolling “successes” (the equivalent of rolling a 5 or 6, both numbers having been replaced, wonderfully, by a Skull-and-Crossbones icon), which means bad luck can certainly make you fail. While you can mitigate this to some degree by sticking to things your captain is good at, the feature of dice rolls only adds to the risk/reward nature of the game. Failing one mission does not mean failing at the game; even failing at combat won’t cost you everything. Combat is very costly by the way. It makes sense, too; these aren’t fast and maneuverable fighters or capital ships that can warp away at a moment’s notice. You’re sailing a ship, a big slow ship and if you’re going into combat you better be ready. Guns fire back and forth and tear masts and hulls and crew to pieces. Even if you win, you will limp back to port to spend a good chunk of your winnings on ship repairs and hiring new crew. There’s always a chance of fleeing the battle, but it is highly unlikely. This is generally a fight to the death, whether that be sinking a ship or boarding it and engaging in desperate crew-on-crew battles in order to capture the enemy’s gold and cargo. The difficulty of combat means it doesn’t happen too frequently, and it discourages players from simply attacking others frequently and for no reason. Fortunately, there is no player elimination. 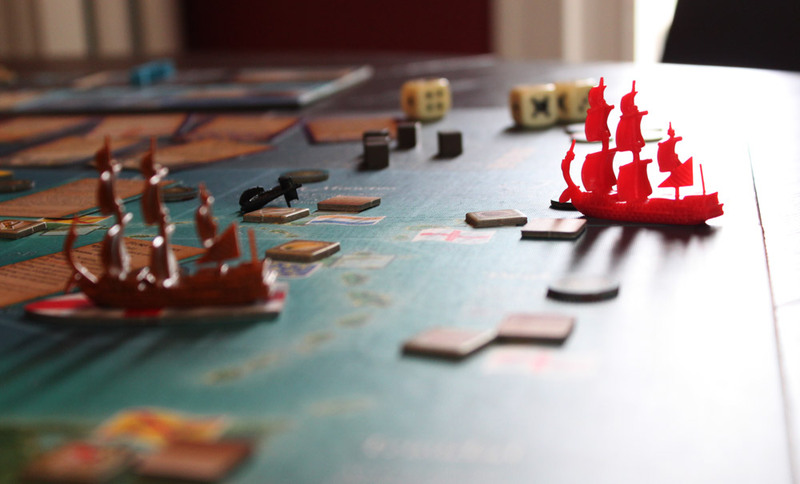 If you lose a battle your captain dies, and you lose the gold, cargo, and cards you had with you. However you keep your glory points and any gold you have stashed. You do start back with a smaller ship, but it is not difficult to get back up to a Galleon or Frigate (which earns you another point with a new captain). It also gives you a chance to explore new tactics; switch from merchant to marauder or vice versa. Sure, losing your cargo, gold, and cards can set you back a bit, but it won’t crush you (unless you’ve been entirely foolish, which is your own fault) and it shouldn’t ruin your fun. This is your ship. Protect it well. If I have complaints about this game, they are fairly minor. The wonky turn pacing, as I mentioned above, is a little strange – having to move across the board and spending your entire turn on that movement is not exactly exciting, especially when surrounded by players who are porting and scouting and missioning. But, action-filled turns are never more than a round away; if you have to spend 3 movement on a turn, you should be in position to do something exciting on your next. It all events out, it just makes some rounds a bit lopsided. Combat is pretty heavily luck based which will definitely be frustrating to some, and it makes certain captains extremely vulnerable to combat. There are ways around this – by avoiding combat, buying ship upgrades, going for boarding if your leadership is stronger than your seamanship, and as I said before losing your captain does NOT mean losing the game, but it’s there. I’m not averse to luck and combat is not particularly central to the game; but I do wish there was a bit more control over the luck elements so you could plan a little better for either offense or defense. 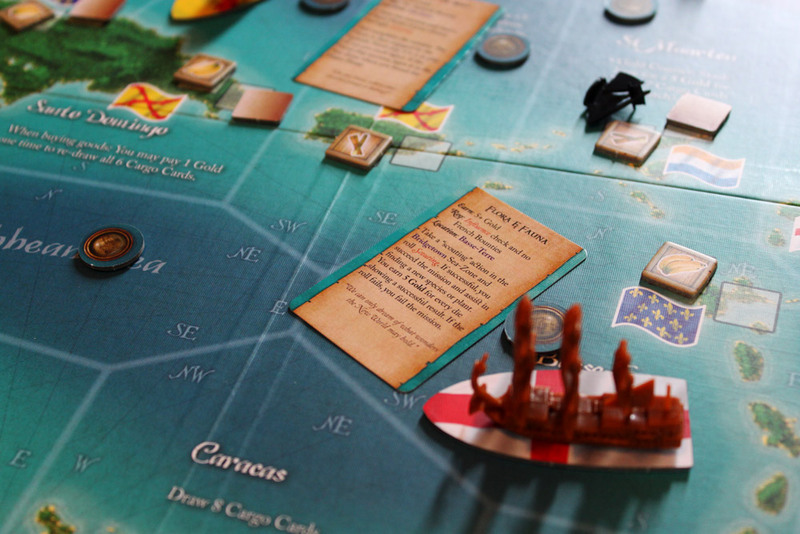 There are minor flaws here and there… you could argue for days (or pages, on BoardGameGeek) about how disadvantaged the Frigate seems versus the Galleon despite the same cost, but nothing deal-breaking or game breaking. 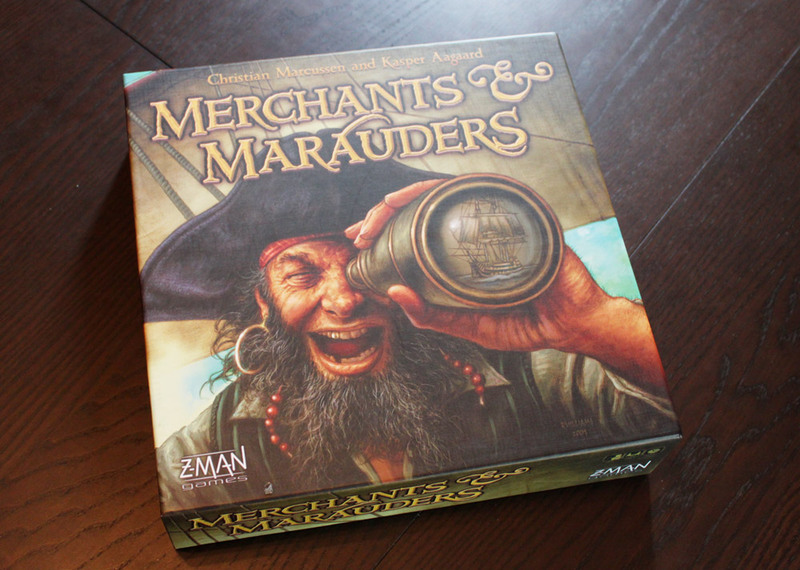 I need to mention (and you may have noticed from the pictures) that Merchants & Marauders is a beautiful game. 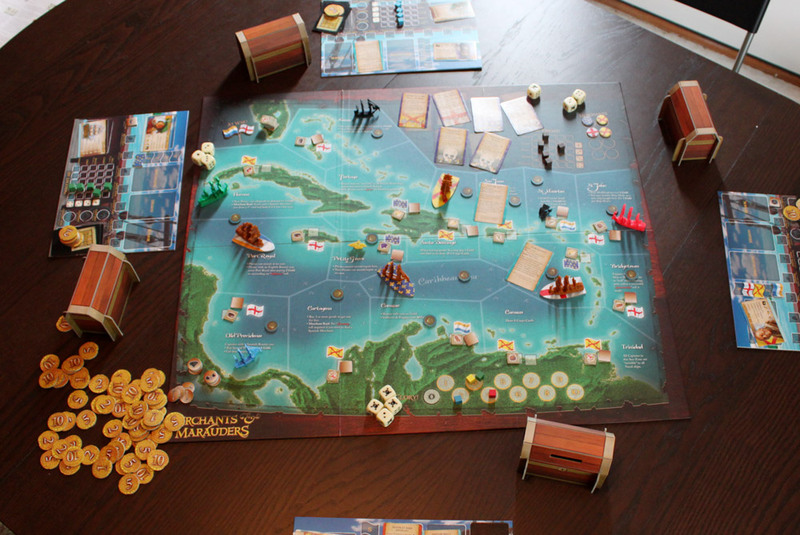 The board is thick, solid cardboard that is beautifully detailed with the caribbean sea and surrounding islands. Player boards are substantial and pretty easy to read. 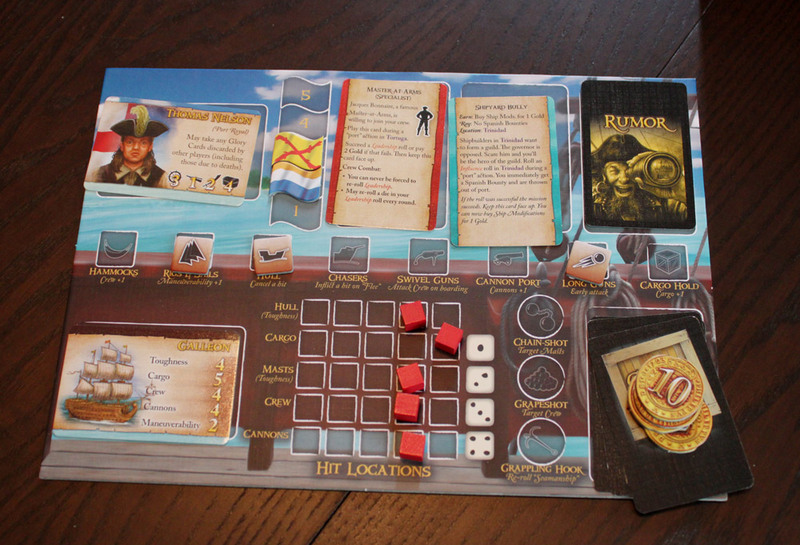 Cards with stats are clearly laid out, and the art depicting the captains and ships just adds to the flavor. Ships are fantastically modeled plastic miniatures complete with sails, although the smallest ones are a bit prone to falling over. 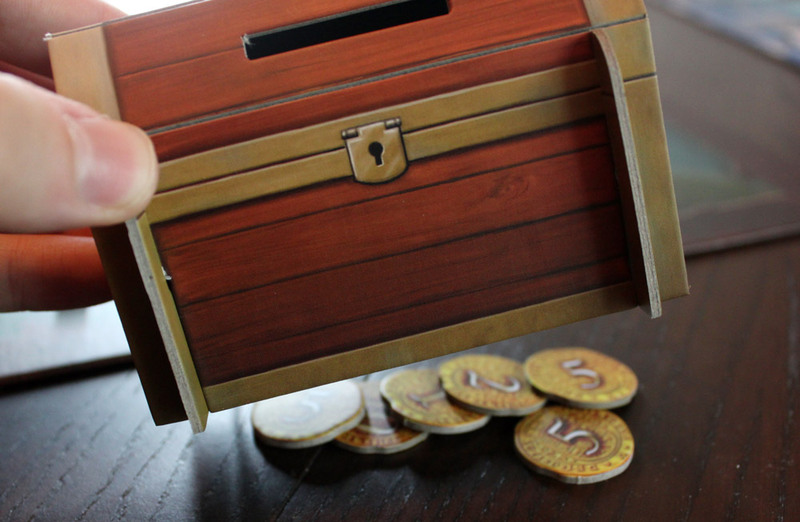 Treasure chests for stashing gold are… well, they’re treasure chests. Suffice to say, your eyes won’t be hurting. Glorious treasure chests filled with booty! So there you have it. Merchants & Marauders is a beautiful game that allows you to become your own ship captain and experience the freedom of the sea (fortunately minus the disease, sea-sickness, starvation, and filth of reality). You’ll undertake missions, raid merchants, fight with pirates, and collect heaping treasure chests. It doesn’t have the most tightly packed mechanisms, nor is it the most streamlined game of all time, but if you get into the theme you’ll have lots of fun, whether you win or lose; although it is definitely satisfying to prove yourself the most glorious of all the players. It’s definitely the best pirate-themed game out there.Drink up me hearties, yo-ho! This is one game I picked up last year that I desperately wanted to like but there was just far too much complexity in something that could have been so simple. I didn’t understand why each area needed to have a special ability. I also felt like the captains were a cool idea but impacted the game far too much for something just randomly dealt out to you at the beginning of the game. I know I’m in the minority here, but still a great review, thanks! Great review, and well-timed to coincide with NTLAP Day. This game certainly looks interesting, but I’m still waiting for my pirate grail. “Privateers” to be published in 2014 looks like it might come pretty darn close. I’ve not played M&M (or Privateers), but my favorite pirate game is Libertalia. It’s kind of like Citadels or Mission: Red Planet, but more interesting (in my opinion). It’s worth checking out. A dude in one of my play groups is planning to get Libertalia soon, so I’ll give it a go then, as it looks fun. That said, my theoretical pirate grail game would be on a much more epic scale (more similar to M&M in that respect). I’ll check out reviews about Libertalia. But, my favorite has been Avalon Hill’s Blackbeard. I’ve played it dozens of times.